The 2016 Nobel Prize in Chemistry - "The design and synthesis of molecular machines"
A much awaited prize announcement , the most prestigious award for Chemistry and Chemists. They developed the world's smallest machines. A tiny lift, artificial muscles and miniscule motors. The Nobel Prize in Chemistry 2016 is awarded to Jean-Pierre Sauvage, Sir J. Fraser Stoddart and Bernard L. Feringa for their design and production of molecular machines. They have developed molecules with controllable movements, which can perform a task when energy is added." from The Nobel Prize website. Optimizing deoxidation and desuIphurization during vacuum induction melting of alloy 718 is now online and free to members of IOM3. "REACH, the European Union’s system of regulations governing the Registration,Evaluation, Authorization and restriction of CHemicals. The set of rules took effect in June 2007 and calls for the phasing in of requirements governing the manufacture, tracking, transportation and eventual ban of chemicals deemed to be harmful to health and the environment. Now, as additional mandates loom, the European chemical industry association, known by the acronym CEFIC, is calling the regulations an over-REACH that threatens to stymie innovation." "Who would wish to innovations which are possibly, or worse, potenially dangerous with no safety net!?" "However, not all chemical companies want to see the European Commission delay the REACH registration requirements or alter the current list of substances to be brought into regulatory compliance. German chemical maker BASF, ranked as one of the world’s largest chemical companies, remains supportive of the regulations. The company says, however, that it’s concerned that REACH’s complexity may jeopardize the goal of strengthening innovation and competitiveness of EU’s chemical industry. NB I trust that the BASF company calling for simplification is not another attempt at passing the buck to avoid necessary health and saftey testing preferably by independent authorities? Labels: EU programme, REACH, Safety of Chemical products. NB. slim on strategic materials, and hence on cost. "Swiss researchers have developed an affordable and scalable way to make atom thin films of tungsten diselenide for converting solar energy into hydrogen. 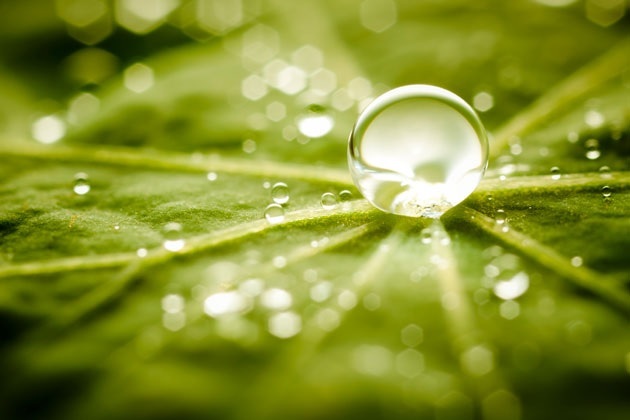 The method, which exploits the interface of two layers of liquid to act as a ‘rolling pin’ to form the films, could bring the goal of cheap solar cells for hydrogen production a step closer." One of a number of such approaches is reported Chemistry World with interviews and comments from reputable critics in the field. John Turner, who investigates hydrogen energy at the US government's National Renewable Energy Laboratory, is unimpressed. While agreeing that improvement is needed but argues that it is difficult to imagine a less-expensive technique than solution-based processing. LINK: Theme Issue 'Plastics, the environment and human health_COP21? Super-repellent coating ready in seconds from Chemistry World and University of Massachusetts_Beating Macintosh. "In recent years, several strategies have been attempted to prepare omniphobic surfaces that repel both polar and apolar liquids. However, they are complex owing to the challenge of creating surfaces with ultra-low contact angle hysteresis, which is what causes liquids to bead and easily slide off a surface. One method is to covalently attach flexible groups onto smooth surfaces to create a slippery liquid-like layer. 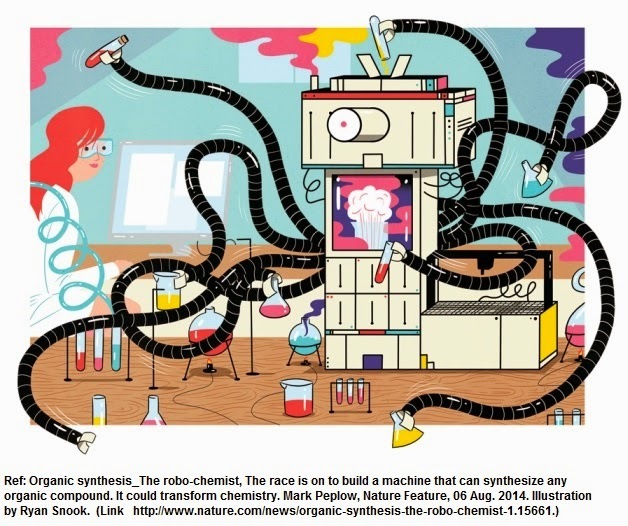 But this approach is usually time-consuming and involves complicated synthetic chemistry." writes James Urquhart in Chemistry World, house journal of the RSC The Royal Chemical Society,UK. Now Liming Wang and Thomas McCarthy at the University of Massachusetts, US, have devised a way to create such smooth and slippery coatings without complex synthetic chemistry and long reaction times. Their method so simple it involves just one step and takes minutes to achieve at room temperature. Labels: Chemistry Society, Chemistry World., Hydrophobic, Innovation in chemistry, Omniphobic, RSC_Royal Society of Chemistry UK. Researchers at the University of Pennsylvania have now pioneered a process that could enable the efficient recycling of two of these metals, neodymium and dysprosium. These elements comprise the small, powerful magnets that are found in many high-tech devices. In contrast to the massive and energy-intensive industrial process currently used to separate rare earths, the Penn team’s method works nearly instantaneously at room temperature and uses standard laboratory equipment. Sourcing neodymium and dysprosium from used electronics rather than the ground would increase their supply at a fraction of the financial, human and environment cost. The research was lead by Eric J. Schelter, assistant professor in the Department of Chemistry in Penn’s School of Arts & Sciences, and graduate student Justin Bogart. Connor A. Lippincott, an undergraduate student in the Vagelos Integrated Program in Energy Research, and Patrick J. Carroll, director of the University of Pennsylvania X-Ray Crystallography Facility, also contributed to the study. It was published in Angewandte Chemie, International Edition. University of Wisconsin-Madison researchers have announced a significant step forward in the development of materials that can ward off oil — a discovery that could lead to new protective coatings and better approaches to cleaning up oil spills. In a new paper in the journal Advanced Functional Materials, professor of chemical and biological engineering David Lynn and assistant scientist Uttam Manna describe new coatings that are extremely oil-repellant (or "superoleophobic") in underwater environments. Looking forward to learning of full size application in order to respond sucessfully to any oil spills. Of course preventive action is preferable. Worldwide Pollution whatever the nature and its human source remains an issue which world leaders cannot be proud of! Eric Betzig, Stefan W. Hell and William E. Moerner share the 2014 Nobel Prize in Chemistry "for the development of super-resolved fluorescence microscopy". Published on 15 Sep 2014 Two simulations show the differences between a battery being drained at a slower rate, over a full hour, versus a faster rate, only six minutes (a tenth of an hour). In both cases battery particles go from being fully charged (green) to fully drained (red), but there are significant differences in the patterns of discharge based on the rate. "As the oil and gas drilling technique called hydraulic fracturing (or “fracking”) proliferates, a new study on the contents of the fluids involved in the process raises concerns about several ingredients. The scientists presenting the work today at the 248th National Meeting & Exposition of the American Chemical Society (ACS) say that out of nearly 200 commonly used compounds, there’s very little known about the potential health risks of about one-third, and eight are toxic to mammals." Should strengthen France's reticence to"easy money" Fracking. Wish I could say the same for UK. And this applies to all activities so badly battered by the poor example of the "so called powers to be from politics (leading by 'bad' example) to athletics (IAAF's interpretation of sportsmanship in the 3000m steeple in Zurich 2014) through the major offender- Soccer (blind to obvious benefits to sportsmanship through video support for refereeing_well proven in Rugby). A growing band of chemists is now trying to free the field from its artisanal roots by creating a device with the ability to fabricate any organic molecule automatically. “I would consider it entirely feasible to build a synthesis machine which could make any one of a billion defined small molecules on demand,” declares Richard Whitby, a chemist at the University of Southampton, UK. “A synthesis machine would be transformational,” says Tim Jamison, a chemist at the Massachusetts Institute of Technology (MIT) in Cambridge. “I can see challenges in every single area,” he adds, “but I don't think it's impossible”. A British project called Dial-a-Molecule is laying the groundwork. Led by Whitby, the £700,000 (US$1.2-million) project began in 2010 and currently runs until May 2015. So far, it has mostly focused on working out what components the machine would need, and building a collaboration of more than 450 researchers and 60 companies to help work on the idea. The hope, says Whitby, is that this launchpad will help team members to attract the long-term support they need to achieve the vision. Bartosz Grzybowski, a chemist at Northwestern University in Evanston, Illinois, who has ambitious plans for a synthesis machine of his own. Yuichi Tateno, an automation researcher at pharmaceutical company GlaxoSmithKline in Stevenage, UK, and a member of the Dial-a-Molecule collaboration. “The hardware has always been there, but the software and data have let it down,” he says. Elias Corey, a chemist at Harvard University in Cambridge, Massachusetts, who formalized the rules of retrosynthesis in the 1960s. Grzybowski has spent the past decade building a system called Chematica to address those problems. 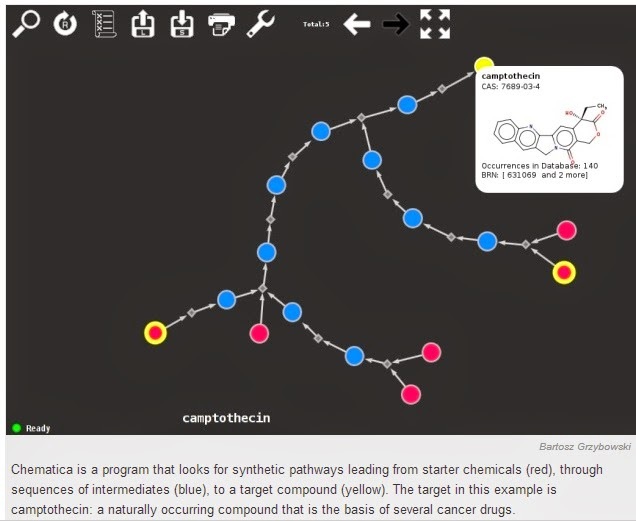 He started by creating a searchable network of about 6 million organic compounds, connected by a similar number of reactions, drawn from one of the main databases behind Reaxys. His team then spent years cleaning up the data — identifying entries that lack crucial information about reagent compatibility or reaction conditions. Editorial: "Gun control: We need a new conversation"
Read more: "Climate report 2013: Your guide to the big questions"
WHEN scholars of the future write the history of climate change, they may look to early 2008 as a pivotal moment. Al Gore's film An Inconvenient Truthwas bringing the science to the masses. The economist Nicholas Stern had made the financial case for tackling the problem sooner rather than later. And the Intergovernmental Panel on Climate Change (IPCC) had just issued its most unequivocal report yet on the link between human activity and climatic change. The scientific and economic cases were made. Surely with all those facts on the table, soaring public interest and ambitious political action were inevitable? The exact opposite happened. Fast-forward to today, the eve of the IPCC's latest report on the state of climate science, and it is clear that public concern and political enthusiasm have not kept up with the science. Apathy, lack of interest and even outright denial are more widespread than they were in 2008. How did the rational arguments of science and economics fail to win the day? There are many reasons, but an important one concerns human nature. Through a growing body of psychological research, we know that scaring or shaming people into sustainable behaviour is likely to backfire. We know that it is difficult to overcome the psychological distance between the concept of climate change – not here, not now – and people's everyday lives. We know that beliefs about the climate are influenced by extreme and even daily weather. One of the most striking findings is that concern about climate change is not only, or even mostly, a product of how much people know about science. Increased knowledge tends to harden existing opinions (Nature Climate Change, vol 2, p 732). These findings, and many more, are increasingly available to campaigners and science communicators, but it is not clear that lessons are being learned. In particular, there is a great deal of resistance towards the idea that communicating climate change requires more than explaining the science. The IPCC report, due out on 27 September, will provide communicators with plenty of factual ammunition. It will inevitably be attacked by climate deniers. In response, rebuttals, debunkings and counter-arguments will pour forth, as fighting denial has become a cottage industry in itself. None of it will make any real difference. This is for the simple reason that the argument is not really about the science; it is about politics and values. Consider, for example, the finding that people with politically conservative beliefs are more likely to doubt the reality or seriousness of climate change. Accurate information about climate change is no less readily available to these people than anybody else. But climate policies such as the regulation of industrial emissions often seem to clash with conservative political views. And people work backwards from their values, filtering the facts according to their pre-existing beliefs. Research has shown that people who endorse free-market economic principles become less hostile when they are presented with policy responseswhich do not seem to be as threatening to their world view, such as geoengineering. Climate change communicators must understand that debates about the science are often simply a proxy for these more fundamental disagreements. Some will argue that climate change discourse has become so polluted by politics that we can't see the scientific woods for the political trees. Why should science communicators get their hands dirty with politics? But the solution is not to scream ever louder at people that the woods are there if only they would look properly. A much better, and more empirically supported, answer is to start with those trees. The way to engage the public on climate change is to find ways of making it resonate more effectively with the values that people hold. My colleagues and I argued in a recent report for the Climate Outreach and Information Network that there is no inherent contradiction between conservative values and engaging with climate change science. But hostility has grown because climate change has become associated with left-wing ideas and language. If communicators were to start with ideas that resonated more powerfully with the right – the beauty of the local environment, or the need to enhance energy security – the conversation about climate change would likely flow much more easily. Similarly, a recent report from the Understanding Risk group at Cardif University in the UK showed there are some core values that underpin views about the country's energy system. Whether wind farms or nuclear power, the public judges energy technologies by a set of underlying values – including fairness, avoiding wastefulness and affordability. If a technology is seen as embodying these, it is likely to be approved of. Again, it is human values, more than science and technology, which shape public perceptions. Accepting this is a challenge for those seeking to communicate climate science. Too often, they assume that the facts will speak for themselves – ignoring the research that reveals how real people respond. That is a pretty unscientific way of going about science communication. The challenge when the IPCC report appears, then, is not to simply crank up the volume on the facts. Instead, we must use the report as the beginning of a series of conversations about climate change – conversations that start from people's values and work back from there to the science. This article appeared in print under the headline "The world won't listen"
"Climate report 2013: Your guide to the big questions"
THE murder of 12 people at the Naval Yard in Washington DC last week was both very familiar and very strange. Familiar in the sense that mass shootings have become part of life in the US. Strange in the sense that the calls for action that usually follow such events were muted, with President Obama's reiterated support for gun control seeming half-hearted. It seems the failure to enact any legislation after the shootings at Sandy Hook elementary school has emasculated the gun control lobby: if the massacre of 20 young children can't shift the argument, nothing will. As The Washington Post concluded: "The issue, for the foreseeable future, is settled: Gun control is dead." One oft-stated explanation is that the gun lobby has quashed federal funding for research into firearms violence. President Obama tried to put that rightafter Sandy Hook. But the new funding he ordered is a modest $10 million and it comes with strings: using the findings of any resulting research to advocate gun control would be a crime (see "The doctor treating the US gun epidemic"). Perhaps that will force gun control advocates to think harder about what they would do with such findings. We know that on "culture war" issues, evidence alone won't win over die-hard opponents – climate change being a prime example. Simply laying out anti-gun evidence, however forcefully and eloquently, may not only fail to change gun enthusiasts' minds, but could cause them to dig their heels in further. Instead, gun control advocates could learn from climate activists who are devising new strategies to win over the hearts and minds of doubters. That means finding ways to convey the issues that don't instantly clash with the cherished values of those they are trying to persuade (see "Climate science: Why the world won't listen"). Rather than make the classic mistake of assuming that evidence alone will carry the day, gun control advocates need clever communication strategies to shift the debate. If they don't develop them, gun control will not only be dead – it will be buried, too. This article appeared in print under the headline "Gun control is dead but not yet buried"
EU-9 Cordis Feeds-Flux -Take your pick? RSS feeds - For more RSS news feeds click the link above. New blog -what features appeal most? from D.Bradley's Sciencebase. Don't hesitate to bookmark me it's free.